by Brown, Fredda E; McDonnell, John J.; Snell, Martha E.
In this authoritative guide, leading scholars and researchers present information and evidence-based practices for dealing with the full range curriculum and instruction for individuals with severe intellectual disabilities and autism. 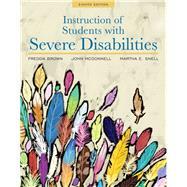 The case studies throughout Instruction of Students with Severe Disabilities look at students of various ages and with a variety of disabilities, and each chapter includes an application to a student with autism. The content is presented with citations of supportive research, and the evidence-based practices are presented in clearly defined ways to ensure that teachers understand the practices and how to apply them in their own classrooms. PowerPoint slides created by the chapter authors are available for course instructors. Dr. Martha Snell is a Professor Emeritus of Special Education in the Curry School of Education at the University of Virginia where she directed the teacher preparation program in severe disabilities for 37 years. With others, she has authored a number of books on teaching methods and the definition of intellectual disability. She has been active in a number of professional organizations, in particular: TASH and the American Association for Individuals with Intellectual and Developmental Disabilities. She has directed both federal and state grants directed toward research and the preparation of teachers. Her research has addressed primarily individuals with autism and intellectual disability and their teachers, but more recently has included Head Start classrooms and young children at risk; research topics have encompassed the inclusion of students with disabilities in general education classrooms, effective teaching strategies, intervention with communication, and positive behavior support for problem behavior. Dr. Fredda Brown is Professor in the Programs in Special Education at Queens College, City University of New York. In addition to Dr. Brown’s work as a Professor and teacher educator, she has spent many years providing educational and behavioral consultation to individuals with severe disabilities and their families. She has co-edited several books, and has authored numerous journal articles and book chapters relating to the education of individuals with severe disabilities. Most recently her work focuses on professional attitudes regarding behavioral treatment acceptability. Dr. Brown is past Editor-in-Chief of Research and Practice for Persons with Severe Disabilities (RPSD), and currently serves on several Editorial Boards, including the Journal of Positive Behavior Interventions (JPBI), and RPSD. She has sat on the National Board of Directors of the Association for Positive Behavior Supports (APBS) and TASH. She presents her work and ideas nationwide to professionals and families, advocating for positive, dignified and effective methods of addressing the learning and behavioral needs of individuals with disabilities. Dr. John McDonnell is a Professor in the Department of Special Education at the University of Utah. His research is focused on curriculum and instruction, inclusive education, and transition programs for students with intellectual and developmental disabilities. His obtained a number of state and federal research, model development, and outreach grants to support his work in these areas. He has co-authored five textbooks and he published numerous journal articles and book chapters focused effective educational services for students with severe disabilities. He serves on the editorial boards of several of the top journals in special education including Education and Training in Autism and Developmental Disabilities, Research and Practice for Persons with Severe Disabilities, and The Journal of Vocational Rehabilitation.